A simulated deployment is a great way to validate detection rules and deployment types prior to deploying an application. In my opinion, there’s one small task that’s missing – the ability to promote a simulation to production. This post will demonstrate how to create a right-click action on the Monitoring->Deployments tab to promote a simulation to a required deployment. You can also see that by default, the script is configured to create a deadline for 8:00 PM of the date in which the script is run. Be sure to modify the script to fit your needs (as well as avoid surprises). You can download the .zip file and follow the directions in the included ‘info.txt’ file for a fast deployment to your admin console. You can view additional details below. First you must create the proper r-click context menu. Copy the following .xml, save it as “PromoteSIMToProd.xml”, and copy it to C:\Program Files (x86)\Microsoft Configuration Manager\AdminConsole\XmlStorage\Extensions\Actions\d1621955-48ad-4bba-9c85-95f74c0c6538\PromoteSIMtoProd.xml. (Adjust the path as appropriate to your ConfigMgr Admin Console installation path). -ExecutionPolicy RemoteSigned -File C:\PowerShell\CM12RClickTools\PromoteSIMToProd.ps1 "##SUB:DeploymentID##" "##SUB:__Server##" "##SUB:__Namespace##" "##SUB:CollectionID##"
$SiteDrive = $sitecode + ":"
#setting a hard avail time and deadline of 20:00 on the same day the script is run. ##$availDate = read-host "Enter deadline date (e.g., 12/02/1973)"
#$availableTime = read-host "Enter deadline Time (e.g., 18:00 for 6:00pm)"
"`nOnly Simulations can be Promoted to active deployments!`n"
#Display info to admin before proceeding. Write-Host "Complete. Press any key to continue ..."
Now re-launch your ConfigMgr Admin console to use the new r-click->Promote Simulation to Production feature. As you can see from the code, we use Get-CMDeployment to obtain the details of the simulation – and we verify it’s a simulation by DeploymentIntent=3. We then perform a WMI query to get information on the targeted collection, so that we can show the admin the total collection member count. After prompting the admin to continue, we simply call Remove-CMDeployment to remove the simulation, and then use the information previously queried and call Start-CMApplicationDeployment to deploy the application. 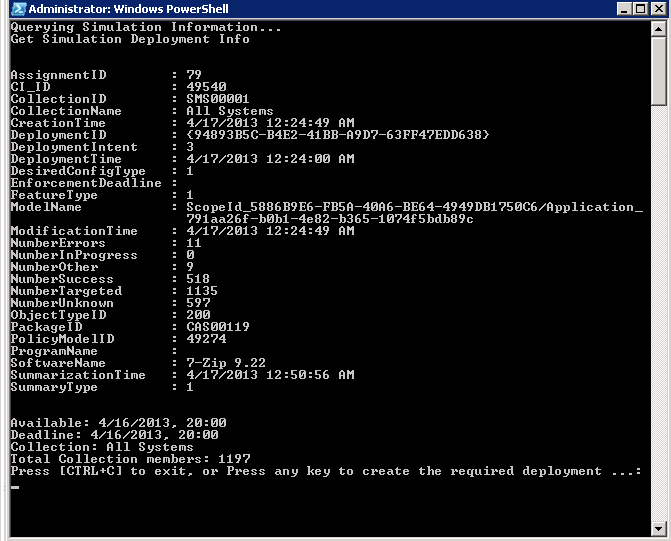 Include additional parameters for Start-CMApplicationDeployment to standardize the deployments for your environment. For example, you could add -RaiseMomAlertsOnFailure $True -OverrideServiceWindow $True to the command line. So as you can see, this could be a huge opportunity to ensure a consistent, automated process for application deployment.